After an enjoyable light lunch at the Bitter End marina with one of our local reps, we returned to Little Dix for an afternoon massage. The spa at Little Dix is brand new and offers an entire menu of indulgent (or necessary, however you want to look at it!) treatments. The list includes all schools of massage, body wraps, manicures and pedicures. One can be exfoliated, moisturized and revitalized, or one can simply sink into a flower bath and relax. 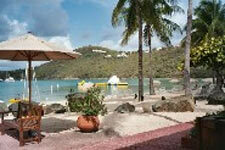 The spa is built high on the hillside just above the villas and has a sweeping view of Little Dix Bay. 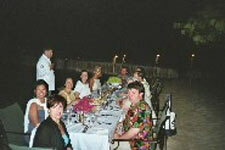 Dinner that evening showcased another new addition at the resort – the new executive chef. After a round of cocktails on the dock, we strolled down to the beach where the staff had set a table for ten, barefoot dining in exquisite surroundings. Tiki torches lit up the sand and, as the tide crept in, the warm sea washed between our toes. We started with Caribbean tapas, followed by lobster, filet mignon and grilled kebabs. Our fellow diners were other travel professionals visiting Little Dix and the new chef was aiming to please – each course was better than the preceding one. We finished the meal with a pistachio crème brulee covered with a caramelized toffee-like topping. After this feast sleep came easy! Severine rose early for a 6:30 a.m. session of yoga at the spa and, after breakfast with the same group of travel professionals, we took a boat to the fabled Virgin Gorda Baths. Ten-feet-high boulders lay piled along the white sand shoreline, creating an enchanting set of caves and caverns from which the sea gently washes in and out. Bathers can snorkel through the passageways or skip along the shoreline of this unique natural wonder. The brave-hearted can be seen leaping off one of the largest, smooth white slabs and splashing down in the crystal blue water. After quenching our thirst with a cold Red Stripe beer followed by lunch back at the resort, we (regretfully!) packed and took the ferry to Tortola, then transferred to the Peter Island ferry. The rain had begun again in earnest, which was unusual in a place that is known for its dry weather and cactus-covered landscape. Aloe plants grow in abundance on Virgin Gorda, along with Turk’s Caps barrel cactus, prickly pears and agave, so we were surprised to experience so much liquid sunshine. It was the gala buffet night on Peter Island and, after the skies cleared, we enjoyed a delightful dinner at a table overlooking the Drake Channel while the lights of Tortola flickered in the distance. The next morning we had an interesting Eco-tour of Peter Island. After lunch at the beach bar it was time to move on again. Destination: the Ritz Carlton St. Thomas, via Tortola, and St. John. We took the ferry transport to Road Town, Tortola, and asked our taxi driver to take us up the spine of the island (instead of the faster, direct route to the West End) so that Severine could get a better grasp of the island’s size and landscape. Sage Mountain rises 1,780 feet above sea level across the center of narrow Tortola, appearing like a thin green slice of lime shot from the blue water below. We took the ferry from West End to St. John, where we had to clear U.S. customs and immigration, and then continued on across Pillsbury Bay to the Red Hook ferry dock on St. Thomas. The Ritz is only minutes away from the ferry dock. The Ritz, as always, speaks for itself: luxury and then some. We had a chance to see the new Club rooms and the new apartments under construction - perfect for families who want their own kitchens and extra space along with all the amenities of the Ritz. We were able to enjoy lunch from lounge chairs on the beach, and then we drove into Charlotte Amalie for a little shopping. We stopped at a colorful street market and Michael found matching Hawaiian print shirts for him and his daughter while Severine bought a nice skirt. Next we drove up, up, up Skyline Drive for a fabulous view of the island and the blue waters below. 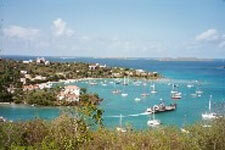 Magen’s Bay appeared in the distance, an enchanting teardrop of emerald water. Severine had never had the chance to see Magen’s Beach, so we drove down to the shore for an all-too-short stroll on the sugar white sands of this gorgeous slice of heaven. As the sun was sinking we returned to the Ritz for cocktails with the management, followed by tasty sashimi and snails at a popular local spot, the Blue Moon Café. We were up at sunrise the next day and caught the morning ferry from Charlotte Amalie to Caneel Bay Resort on St. John. The ferry is the resort's private boat, and we arrived on the property in less than an hour. Caneel Bay also originated as a Rockefeller dream and is a sister resort to Little Dix. The resort boasts a “beach for every day of the week,” with seven secluded curves of white sand sculpting the 170 acres of this lush property. Two thirds of the island is the protected Virgin Islands National Park, and the resort's comfortable elegance gracefully reflects the pristine natural beauty of the park. The rooms are designed so that they are barely visible along the resort’s pathways and beaches, and “wake-up calls” are a simple knock on the door. We had some free time to enjoy snorkeling in the warm crystal water and then dried off for an interesting “class” at the resort’s Self Centre. The center unique classes include Drumming Circle, a Celebration of Life class, Imagery for Relaxation and Wellness, and Mindful Meditation. We enjoyed an hour and half session on relaxation and breathing, a class that included some yoga and some exercises one can do while in a car or on an airplane. As our week in the islands drew to a close we had a chance to see the new "Heavenly" program at the Westin. The "Heavenly Bath" features extra thick, soft bath towels while the "Heavenly Bed" rooms have extra comfortable beds with feather cushion on the mattresses, high-thread count sheets and beautiful comforters. On our last morning in the islands we had time for one last stroll on the beach at Caneel Bay. We sunk our toes in the warm sand, gazed out at a ship slowly sailing past and agreed that feeling "heavenly" was one thing that wasn't new this spring in the islands - feeling heavenly in the Virgins is eternal.